prominent figures involved in promoting biodiversity, conservation and sustainability. ~ reaches the sea at Raumati Beach. Usually it is a stream that flows quietly, but occasionally it washes over its banks west of Coastlands. Back in mid 1976 there was a major flood in Raumati Beach after persistent heavy rain in the hills behind Paraparaumu. Timber from Paraparaumu Timber and Hardware over the railway line created a temporary dam and water flooded into farmland and number of Raumati Streets. 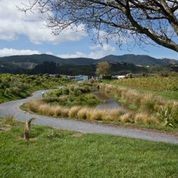 In Kiwi Road the water rose to over a metre at the northern end and a rowing boat was used by one gentleman to ferry people along the cul de sac! Another resident bringing his son home from Raumati School had to hoist the lad onto his shoulders whilst he waded through the wash. Since that time, improved drainage, regular dredging and the creation of stop banks have prevented further flooding downstream. 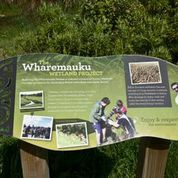 The Friends of Wharemauku Stream (FOWS), began in 2008, following a public meeting organised by Councillor Diane Amundsen, and Council Biodiversity expert Rob Cross, to present a report on the Wharemauku Stream prepared by Steve Aitken. Steve, a teacher at Raumati South School, had completed a period on leave from his school, funded by the Royal Society of NZ. In his report Steve recommended that the highest priority for improving the overall health of the stream would be to improve the quality of Drain 6, one of the stream’s tributaries. In particular he recommended establishing a wetland near the outflow of Drain 6. 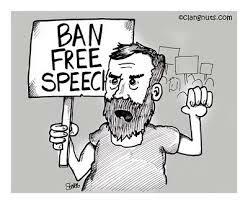 FOWS and the Kapiti Coast District Council (KCDC) accepted the recommendation. The first stage of the work took place in June 2009. Five years on, those plants are now well-established, providing shade to the branch of Drain 6 which runs beside them, thus lowering the water temperature, and increasing the dissolved oxygen level in the water. 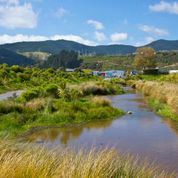 During 2009-11, investigation, planning and design took place to construct the wetland proper at the confluence of the two branches of Drain 6, funded by the Kapiti Coast District Council (KCDC) and the Greater Wellington Regional Council (GWRC). Construction took place in mid-2012, with initial planting later that year. Further planting took place in 2013 and 2014, funded by Transpower as a Greenline Partnership, and including volunteer planters from Transpower staff. 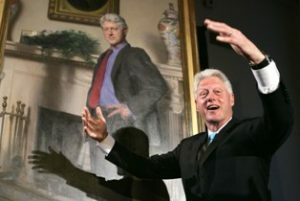 They enjoy getting out as Mike testifies: It’s a really good day, and makes a change from being in the office! 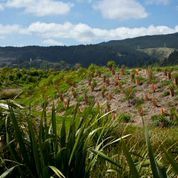 Earlier this year, Council staff and members of the Wharemauku conservation group joined Transpower staff in planting along two banks on the land between the Community Centre and the Library. 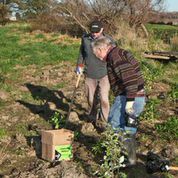 Throughout the years from 2009 onwards, volunteers from FOWS have helped maintain the plantings, through regular weeding/releasing work, ensuring the young plants are given the best possible opportunities to take root and prosper, free from weed competition. 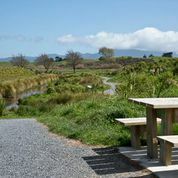 The Friends have been mainly involved in developing the Wetlands site on both sides of the track that runs west off Rimu Road opposite cityfitness. Lyall Perris coordinates activities and Councillor Diane Ammundsen is an enthusiast member. 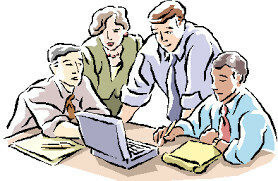 The group would welcome more volunteers. So the commitment is only two hours a month. And the next session is coming up on Sunday 16 November.